WASHINGTON (NASA PR) — NASA partnerships are crucial for expanding capabilities and opportunities in space. The agency’s Space Technology Mission Directorate (STMD) is seeking new partnerships with U.S. companies through an Announcement of Collaboration Opportunity (ACO) solicitation. STMD has five strategic thrust areas, representing the capabilities needed for robotic and human exploration of the Moon and Mars. WASHINGTON (NASA PR) — Artificial intelligence, nanotechnology and 3D printing are just a few of the technology threads pitched during the third cycle of the NASA iTech competition. With an eye on how these promising ideas could benefit space exploration, NASA has selected 25 competition semifinalists. WASHINGTON, DC (NASA PR) — Throughout 2017, NASA’s Space Technology Mission Directorate (STMD) made noteworthy progress in maturing and demonstrating technologies to bolster America’s space agenda, while setting the stage for vital advancements within the next several years. From expanding the utilization of space in low-Earth orbit and enabling new scientific discoveries, to advancing capabitilties for robotic and human exploration of deep space destinations – STMD is executing a broad cross-cutting agenda, one that is pioneering groundbreaking technologies and knowhow. 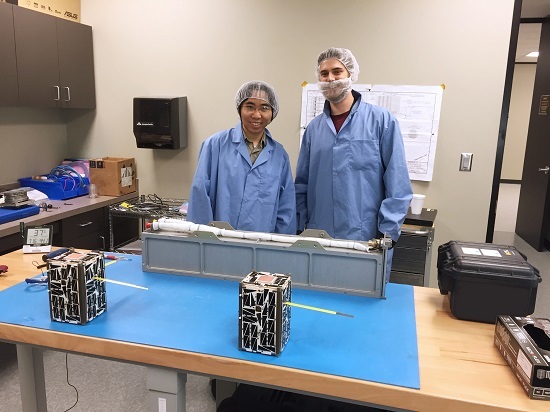 WASHINGTON (NASA PR) — NASA is partnering with eight U.S. companies to advance small spacecraft and launch vehicle technologies that are on the verge of maturation and are likely to benefit both NASA and the commercial space market. These partnerships are the result of a solicitation released in August 2016 by NASA’s Space Technology Mission Directorate (STMD), titled Utilizing Public-Private Partnerships to Advance Tipping Point Technologies. 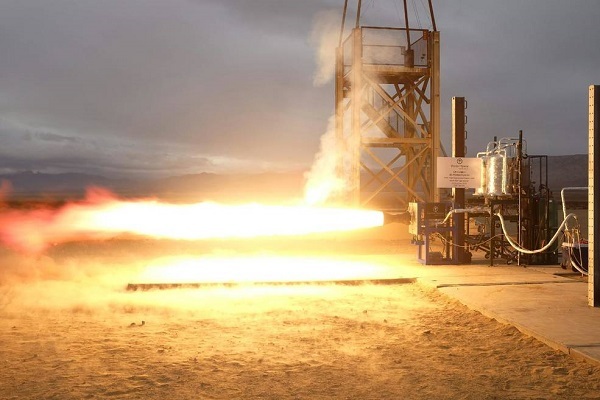 They mark the second round of public-private opportunities that enable industry to develop promising commercial space technologies that also may benefit future NASA missions. WASHINGTON (NASA PR) — NASA is seeking partnerships with U.S. companies focused on industry-developed space technologies that can advance the commercial space sector and benefit future NASA missions through the “Announcement of Collaborative Opportunity (ACO)” solicitation released by NASA’s Space Technology Mission Directorate (STMD). WASHINGTON (NASA PR) — NASA has selected 13 university-led proposals for the study of innovative, early stage technologies that address high priority needs of America’s space program. The Early Stage Innovations (ESI) grants from NASA’s Space Technology Research Grants Program are worth as much as $500,000 each. Universities have two to three years to work on their proposed research and development projects. WASHINGTON (NASA PR) — NASA announces the addition of its newest virtual institute to advance the field of small spacecraft systems. 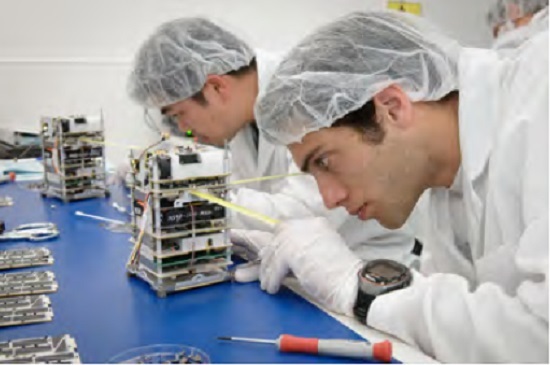 The Small Spacecraft Systems Virtual Institute (S3VI), hosted at NASA’s Ames Research Center in Moffett Field, California, will leverage the growing small spacecraft community, promote innovation, identify emerging technology opportunities, and provide an efficient channel for communication about small spacecraft systems with industry, academia, and other government agencies. 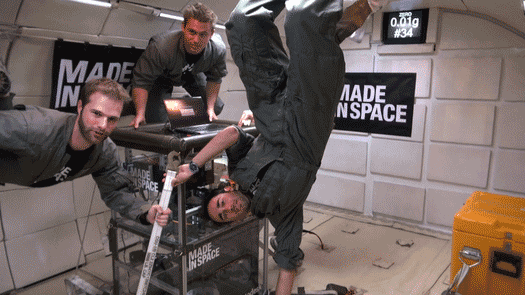 Made in Space employees on a Zero G research flight. WASHINGTON (NASA PR) — NASA’s Flight Opportunities program has selected 13 space technology payloads to flight test on parabolic aircraft, high-altitude balloons or suborbital launch vehicles to demonstrate new technologies. The selections were made through the agency’s Space Technology Mission Directorate (STMD) in Washington. WASHINGTON (NASA PR) — NASA, in partnership with the nonprofit Methuselah Foundation’s New Organ Alliance, is seeking ways to advance the field of bioengineering through a new prize competition. 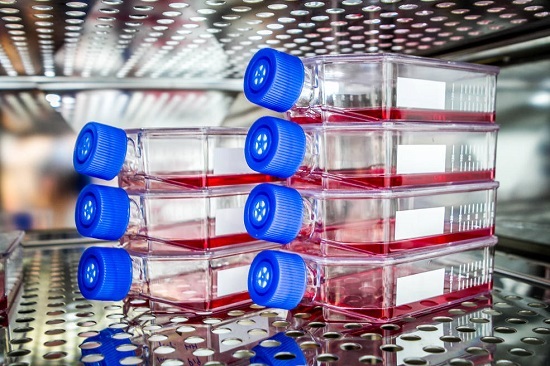 The Vascular Tissue Challenge offers a $500,000 prize to be divided among the first three teams that successfully create thick, metabolically-functional human vascularized organ tissue in a controlled laboratory environment. 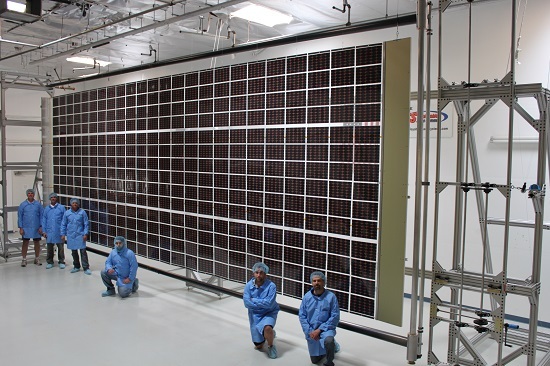 WASHINGTON (NASA PR) — NASA’s Space Technology Mission Directorate (STMD) worked with two private firms to develop advanced structures for high power solar arrays that are stronger, lighter, and package more compactly for launch. 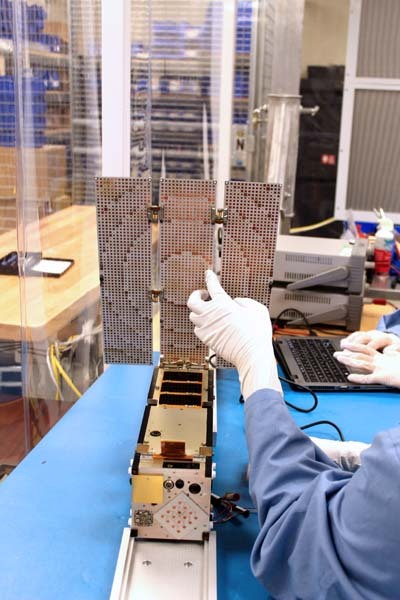 This technology investment furthers the agency’s deep space exploration goals and aids the commercial communications satellite industry, the provider of direct-to-home television, satellite radio, broadband internet and a multitude of other services. MOFFETT FIELD, Calif. (NASA PR) — After a five-month stay aboard the International Space Station, NASA’s two Nodes satellites were deployed on May 16 from the NanoRacks platform and into low-Earth orbit to begin their much anticipated technology demonstration. These tiny satellites have dimensions of only four by four by six inches. 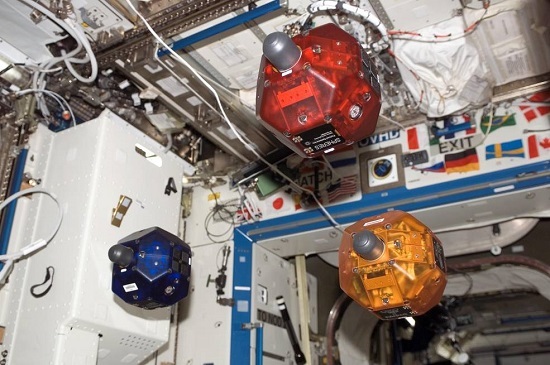 The ground controllers for the Nodes mission received confirmation that both satellites are transmitting and are in good health when they passed over the tracking station for the first time, soon after deployment. 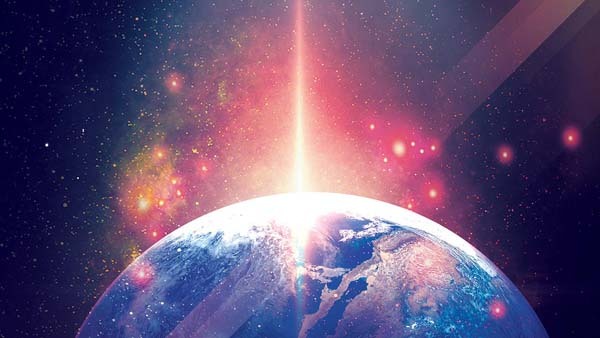 The first transmission of science data is expected by May 18. MOFFETT FIELD, Calif. (NASA PR) — Imagine you’re sitting in class watching a scene from “Star Wars” and your professor assigns a project meant to fly in space. In 1999, that is exactly what happened for engineering students at the Massachusetts Institute of Technology in Cambridge, Massachusetts. 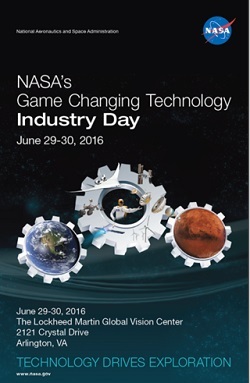 WASHINGTON (NASA PR) — The Space Technology Mission Directorate (STMD) is hosting the Game Changing Technology Industry Day to engage the aerospace industry and identify potential areas of common interest and synergy with NASA. The objective of the meeting is to enhance industry awareness and understanding of the mid-level technology investments within the Game Changing Development portfolio. The Game Changing Technology Industry Day will focus on 11 current technologies that are potential targets for commercial and academic partnerships. Attendees will hear from project managers about the exciting work going going on within STMD and have the opportunity to see hardware and ask questions in person. By joining this Industry Day, participants will have the unique opportunity to listen and engage with NASA technologists who seek partnerships that can further innovation in space exploration. For more information and the agenda please go to www.nasa.gov/spacetech. In addition, the event will be webcast live via UStream. Details will be provided closer to the event date. 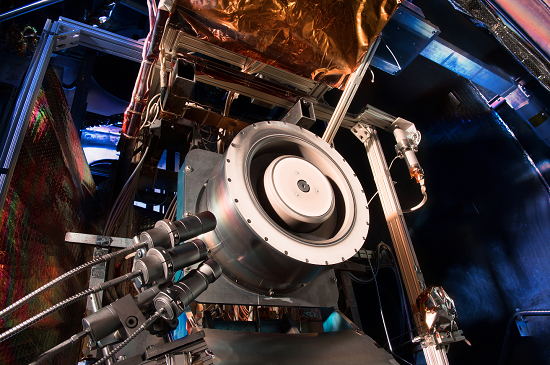 WASHINGTON, DC (NASA PR) — NASA has selected Aerojet Rocketdyne, Inc. of Redmond, Washington, to design and develop an advanced electric propulsion system that will significantly advance the nation’s commercial space capabilities, and enable deep space exploration missions, including the robotic portion of NASA’s Asteroid Redirect Mission (ARM) and its Journey to Mars.